Being a Gran Turismo franchise advocate since the very beginning, I suppose it's safe to use the cliché "good things come to those who wait" because after 5 years in the making, various release date delays and weeks of waiting and resisting the urge to buy the regular version have finally paid off, I finally found a store that had a few stocks left of the Limited Edition version of Gran Turismo 5! (Sadly, I didn't get to reserve or pre-order on time for the release so all the Collector's Edition copies were off the shelves faster than a chicken on fire!) What came with this edition aside from the game of course was the Apex: Ultimate Car Guide book (pretty awesome), a DLC Redeem Code (plus a neat holographic card of the car you get, I got the Nissan GT-R GT500), a Gran Turismo decal set (various sizes and designs) and a poster. Not bad, considering the regular version and the Limited Edition only differed by a few hundred bucks (Philippine Peso). Now, we have one nagging question in mind, was this game really worth the wait? I will do my best to answer this question as this review goes on. So upon running the game, I was prompted for a software update, naturally, I'd accept it, thinking it would simply take a couple of minutes, little did I know that the update was 608MB worth! I stared at the progress bar that seemed hopelessly frozen, after 20 minutes, I couldn't stand it, I cancelled the update and ran the game without it. As expected, Polyphony Digital and the rest of the developers will treat you to a quite long and beautiful intro movie (except for the music that didn't seem to go with it), I will not go into detail, but I will say that one may encounter a graphical overdose (trust me, this is one overdose you'd love.). After the movie, you are led into a simple menu screen. I decided to choose the Arcade Mode first to see what beauties they had to offer. I was pleased to see some very sumptuous vehicle choices, from exotics, to muscles, to supercars to daily drivers, to classics, to rally, to F1 and more, way more, real world automobiles. 1. My Home- This is the "main menu" for your career as a racer, in this area you can prepare for races, join various events, access your garage, tune your vehicle, visit the used car lot, practice, acquire licenses, etc. In this screen, you can also customize your GT Profile which is pretty much who you are in the Gran Turismo world, I liked the fact that they made it highly customizable, you can change the theme, color, wallpaper, profile photo of your GT Dashboard screen. This is where it all starts. 2. Level Up Aspect- For anyone who has played a Gran Turismo game, you know that in order to participate in certain events or have access to certain vehicles and events, you need to acquire licenses. Gran Turismo 5 has now decided to use an "experience" system wherein a player can gain experience points to level up, these in turn allow you to participate in events or purchase cars based on your level. 3. A-Spec Events and B-Spec Events- This is a new addition, it's pretty much the main events of the game. By competing in either of these events, you will earn money and experience points. The A-Spec Races are your usual, straightforward, first place wins kind of race, from here, you work your way up until you unlock more events and vehicles as you level up. Now as for B-Spec events, this is a totally new concept, this pretty much a "hands free" event wherein you no longer have to drive the car. Here, you create/select a driver and then enter him in a race. You also earn money and experience points from these events. The drivers have certain types of "personalities" that bring with them various traits and abilities, these aspects will affect how the driver performs during a race. Once you have chosen your driver, you can now begin the race, the players only task here is to "coach" the driver with 4 commands that tell him to either lower his pace, maintain his pace, pick up his pace and overtake. Now this may seem simple enough, but there are things you need to consider, excessive commanding may cause your driver "lose focus" and end committing mistakes that may cost you the race. 3. Create A Race Track- Aside from just all out racing, the game has added a feature that allows players to create their own race track and upload it for the use of the gaming community. You can create the scenery of the track, the length, the sharpness of curves and turns and the weather of the track, this feature certainly adds to the replay value of the game. 4. Online Multiplayer- Now this is the first time this feature was included in the entire Gran Turismo franchise. The concept of multiplayer is quite simple, enter the Open Lobby on the My Home menu screen, find a room, look for a race (either Free Run or Shuffle Race) then hit the gas and enjoy! Another concept added to the online aspect of this game is being able to join the Community Area on the My Home menu, here players can view their online friends, post messages and give gifts (you can give away cars! O_o). 5. Special Events- Aside from the two main events mentioned above, this is another one where players can participate in, by earning experience points and leveling up, one will be granted access to various special events, such as NASCAR, Rally, Drifting Events and Go-Karting which is a pretty good add-in to the game. 6. The Concept of Vehicle Damage- This is one thing I've always thought was lacking from the Gran Turismo franchise, finally, they have added this feature, although it is nowhere near the damage modeling that Grid possesses, I'm very pleased that it has now been included. Of course, with new features come the maintenance of the old ones, personally, I'm glad they maintained the License Test feature, this was one of the defining aspects of the entire franchise. 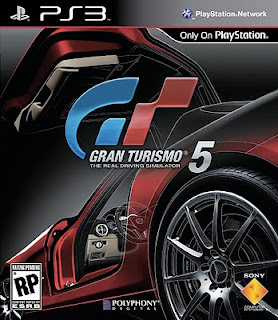 For those who've never played any Gran Turismo game, the name of the feature speaks for itself, you go through a series of driving tests in order to earn a certain license, the degree of difficulty varies, it's quite challenging but still fun overall. Also, I liked that they maintained the Used Car Lot in the Career Mode because here lies the discovery of rare vehicles that are not offered in the Dealerships, always be on the lookout, you never know what you might find. O_o Also, the usual Arcade Mode, VS mode and Practice Mode has also been retained. Sadly, this game is not perfect and there are some things that did leave me quite disappointed. First off, the graphics aren't that amazing, for a game that was in development for five years, I was expecting a lot more. In all honesty, if you were to compare this game to Need For Speed: Hot Pursuit, graphically, Need For Speed would have a slight edge. But I'm not saying the graphics of this game aren't superb, because they are, all I'm saying is that given the amount of time it took to make, I think they could have done better. Another minor detail that I wish was worked on was the fact that Porsche isn't included in the car list, sure RUF is the closest you can get to it, but Porsche is Porsche, most car enthusiasts would share the same sentiments I suppose. Haha. Overall, I think that this game is a must-have for every car enthusiast and racing gamer alike. For die-hard Gran Turismo game players such as myself, this purchase was inevitable, because not getting this game would be as foolish as challenging a Bugatti Veyron using a Kia Pride. Hahaha. Overall: 9/10, a very satisfying game with a high replay value, blessed with tantalizing graphics and an insane amount of vehicle choices.